Mystic Precision Bipod (MPOD) 3.125" by EGW :: Bipods, Monopods and Accessories :: Tactical Works, Inc.
MPOD Design: Improved geometry to reduce the effects of torque during recoil for consistent tracking and follow through. Easy to operate with large range of movements to account for varied terrain. Easy to install and remove. Solid with great repeatability and accuracy potential. Stability increasing with increased pod height which is opposite to a number of designs. Keep finished weight as low as possible - 12.8 oz installed, yet strong enough to support heavy rifles and big boomers. The MPOD's are made from aircraft grade aluminum with quality steel hardware and lugs for durability and long life. The exterior is a milspec anodizing which not only looks great, but will stand up to lots of normal use. The installed pod weighs 12.8 oz which makes it the lightest F-class suitable pod we are aware of. If you want to save even more weight, you can swap in bolts of the knobs and that will cut another 1.5 pz of the total weight. This MPOD is designed for forends up to 3 inches. Ease of assembly and use have been retained. Stability and strength will exceed anything an F class shooter (or most shooters for that matter) will need. The lowest height is 4.5" suitable for bench work and raised berms when shooting prone. At full elevation, you have 7.75" to the mounting lug. For most rifles, you can shoot on a flat surface and still get into a comfy position. Best part, the MPOD gets a wider footprint for improved stability the more you raise the pod. Most ski pods pull their legs in to raise the rifle. That make the rifle even more tippy. Uneven ground? 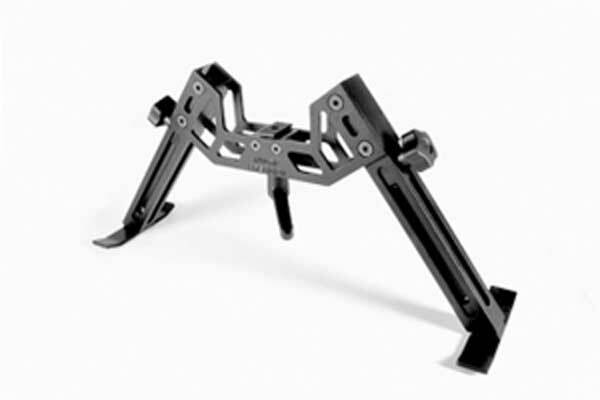 The MPOD can handle a 4 inch difference between legs and still stand. Stores flat in your rifle case making it easy to get to and from the range. I love the Mpods. Up until this season I had just the narrow version that I shared between 5 rifles but I built a new rifle that has a very wide for-end so I opted to buy a second. Very solid construction, rifle hangs down below the axis of the legs and they mount in an instant. What more could you ask for? Fantastic stock. A little heavy but it takes quite a bit of the recoil making my 7mm Mag Savage a lot more comfortable to shoot.